The lights in the corridor synced with Jake’s ID and led him through the station’s maze. He passed people his age and older, some bustling and others with halting gaits but all on some duty. The uniforms varied in design and color that left him bewildered as to their functions. Each time Jake passed an intersection, he consulted his ID for directions as it blinked in the direction of his quarters. When he arrived, Jake pressed his card and hand over the sensor and the doors swished apart. He stepped over the runner into the room where dim lights glowed over a neatly made bed. The lights brightened at a gradual pace. He moved to the closet and found several uniforms pressed and hung. Jake touched them in turn. He nodded at the sharpness of each set. “Good enough.” His old one was not present. Probably lost or discarded when the transport was unloaded. “Yeah they give those out for good service awards. You got to be here five home-years to get one, then it’s something every year. They call it incentives. It’s really bribery against just acting retired.” She shrugged. “What do I care? They start fixing things and I feel better. It’s better than staring out the window and moping.” Dot continued by telling him gossip about people he didn’t know and probably wouldn’t meet. Jake listened but his eyes drooped by the end of the haircut. “No, really, it’s the trip.” And her–but no sense in being impolite. Dot shrugged and hauled her equipment away in the corridor. He shrugged. “Show me the message.” Jake stood at the projection console. “Go back to that assignment and hold.” Jake leaned forward. He squinted with his mouth open. The marker appeared in the projection. Archangel Jake stood and paced the floor, his hands clasped behind his back. He tucked his chin as he walked. Something interesting already. Surely others would take it or claim seniority over him. “Dim the lights.” There was plenty of time before the meeting. He undressed and lay on the bed. Jake stared at the projection as it hung over the desk. He’d check the status when he woke. Jake closed his eyes and shifted into a comfortable position. It was a good bed and adequate quarters. A memory hovered behind his closed eyelids of a trip taken during his months of preparation to leave home forever. 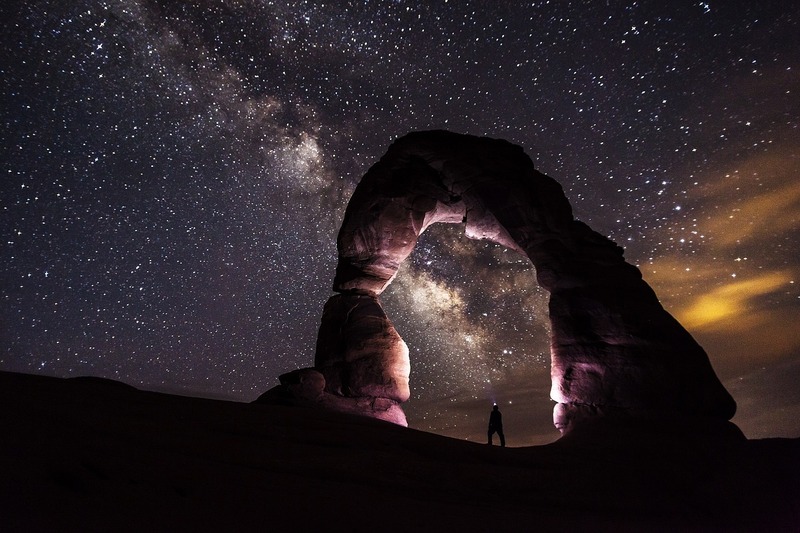 He’d stood beneath a natural arch of rock and stared at the night sky, what was to become his new home and here he was. The stars flickered endlessly then, like fireflies, as he’d wondered what his future held. Jake remembered those moments, the unfamiliar uncertainty mingled with the approaching finality. He inhaled, then exhaled, and released memories of his old home now thirty years past and slept in new his new one. Check out Endless Doors – Part 5, as part of the Tuesday Tales feature from this post on The Archer’s Aim blog.